The 49th annual Rock Gem & Mineral Show hits the Rock County Fairgrounds Saturday, March 23rd and Sunday, March 24th. 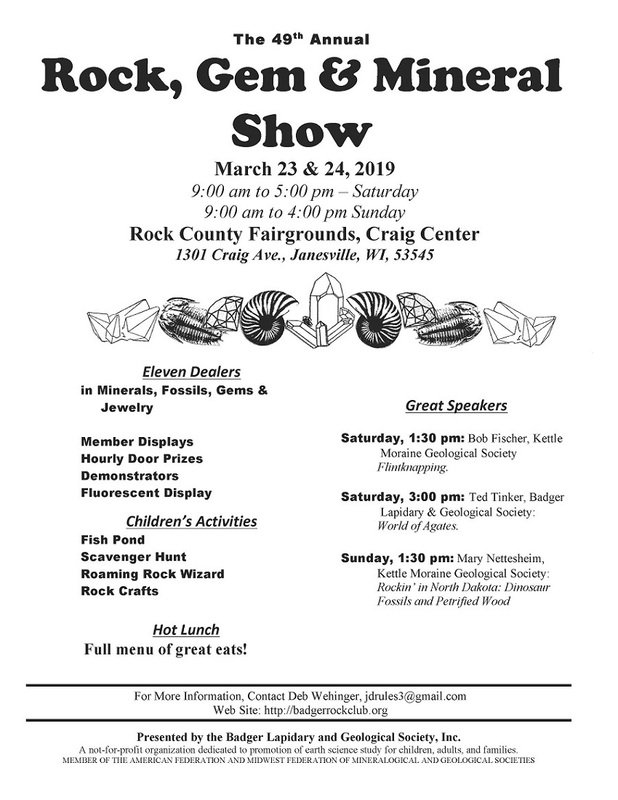 The Badger Lapidary and Geological Society presents this show, with dealers, excellent speakers, many beautiful club displays, lapidary demonstrations, club sales table, door prizes, educational films and activities for kids. A full menu is available. Eleven dealers will be at this show dealing in minerals, fossils, gems, and jewelry. Children’s activities include a fish pond, scavenger hunt, rock crafts, and the Roaming Rock Wizard. You’ll find the Rock County Fairgrounds on the east side of Janesville, the “City of Parks.” I-39/90, U.S. 14, U.S. 51, and Highways 11 and 26 all bring you there!